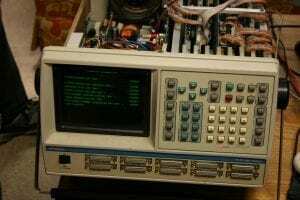 Home » BLOG » What is a mixed signal oscilloscope? In the world of electronics, an oscilloscope is one of the most used tools. And of course, no two models of oscilloscopes (or simply ‘scopes) are the same. But a mixed signal oscilloscope is something else entirely, right? In this blog post, we’ll untangle the mysteries behind a mixed signal oscilloscope and find out what it does, what the differences are between this device and an ordinary ‘scope, so when you’re done reading, you’ll know exactly what a mixed signal oscilloscope is. People familiar with the inner workings of an oscilloscope can skip this paragraph, but to fully understand a mixed signal oscilloscope, it’s important to start at the base model. A classic oscilloscope is a device that measures an electrical signal over time and translates the results of its readings to a graph. This way, the oscilloscope makes something intangible like voltage (and the frequency, amplitude, and distortion) easy to analyze. Older models oscilloscopes worked with a CRT, the tube-like screens that were also common in computer monitors and TVs. New models generally feature a digital screen that also allows for extra functionality. These models also have to use a digital signal processor to carry out the measurements. Why do people use an oscilloscope? As we mentioned, the function of an oscilloscope is to put the data of a measured voltage and its related data points in a graph that shows changes over a certain period of time. This visual element allows you to spot problems that can’t be (as easily) seen with a digital multimeter, which is limited to one data point at a time. By seeing the changes in any of the data points, troubleshooting is a lot faster and easier. Put in other words, an oscilloscope analyzes data, whereas a multimeter just measures it. That means people use an oscilloscope to troubleshoot faulty electronic equipment. Because there are different connections in any electrical component, you can troubleshoot each of the connections to better pinpoint not just where the problem area is, but what (type of) problem causing the malfunction. Although seeing this data in a graphic form is already helpful to troubleshoot electrical issues, sometimes you’ll want different types of data coming in at the same time. Especially with digital information, you often get a number of different data points. To tackle all this incoming data in a comprehensive manner, a logic analyzer can help. This type of device can take data from multiple sources and display it at the same time or even convert it into another type of data, such as a table, a diagram or even software-based results. Because it takes in multiple types of data at once, it increases your effectiveness in the analysis. How do an oscilloscope and a logic analyzer work together? By combining the two different instruments, you can double up on the analysis. First, the results from the oscilloscope can tell you a number of basic things about the electrical component or circuit you are testing. Second, the data points on the output end of the scope function as input data points for the logic analyzer, giving you a chance to skip a step in the process and get a second-level analysis right away. When you’re combining an oscilloscope and a logic analyzer in one device, you’re talking about a mixed signal oscilloscope. Because the logic analyzer is equipped to deal with multiple data points at the same time (usually 16 or 32 channels in a normal range mixed signal oscilloscope), you can get different data points coming it at the same time. Another benefit of mixed-signal oscilloscopes is that they can capture both analog and digital data at the same time, so you can compare both channels. What should I look for in a mixed signal oscilloscope? The number of channels for the logic analyzer – while a mixed signal oscilloscope will never reach the same capacity as a stand-alone logic analyzer, a higher amount of channels that can be analyzed does mean a better performance. Digital and/or analog channels – if you know what type of data you’ll be working with most, make sure your mixed signal oscilloscope can handle it, too. The better models will be able to handle digital and analog information simultaneously. Sample rate – the sample rate is expressed in GS/S, or Giga-Samples per Second. This is an indication of the data flow that the mixed signal oscilloscope can handle. The baseline is 1 GS/S but better models will have a higher number here. Most models will offer a compromise on these features but finding the right mix within your budget is key to getting the model oscilloscope that works best for you. If you’re a professional looking to maximize on each of these features, you’ll have to look for a higher-grade industrial oscilloscope. A mixed signal oscilloscope is an oscilloscope with a logic analyzer built in. Even though the built-in logic analyzer will generally not pack the same power capacities of a logic analyzer by itself, the possibility to gather data and analyze it right away is a great addition to any oscilloscope. Some mixed signal oscilloscopes will work with software that radically widens the range of analyses that can be carried out. When looking for a mixed signal oscilloscope, most people will have to settle for a trade-off in key features. In this blog post, we have listed those features and some of the common baselines, so that customers looking to find a well mixed signal oscilloscope can make an informed buying decision. Customers that can’t compromise for professional reasons will have to look at industrial grade level oscilloscopes and hook it up to a logic analyzer. The mixed signal oscilloscopes will generally not be equipped for the heavy duty work of each component by itself.